Is your toilet taking a leak? In Minnesota, we have some of the cleanest public water supplies in the nation. However, Minnesota's thirst for this precious resource is outpacing nature’s ability to replace it. It is safe to say that water conservation is more important than ever. There are lots of ways to use less water. Start by checking your home for leaks, as a part of Fix a Leak Week (it's this week!). Household water leaks can waste hundreds of gallons of water and can increase your water bill by over 10 percent. 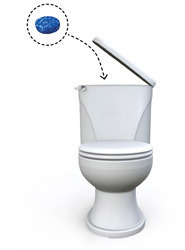 Another way to check for leaks is to go straight to the likely culprit--the toilet. Toilets leaks are common and waste hundreds of gallons of water each day. Use the dishwasher and only run full loads. Turn off the water while you brush your teeth. Take shorter showers. Can you do 5 minutes or less per person? Use low-flow faucet aerators and shower heads. The WaterSense label can help you identify water-saving products. CenterPoint Energy offers free, low-flow shower heads and faucet aerators to its residential natural gas heating customers in Minnesota. The Home Energy Squad will come to eligible homes to assess and install energy-saving items (including new shower heads and aerators). You pay for the parts, but the labor is free. Owatonna Public Utilities, the City of Victoria, and the City of Eden Prairie. The Minnesota Pollution Control Agency (MPCA) is now accepting applications from organizations interested in participating as a host site for the 2013 - 2014 year of the Minnesota GreenCorps program. Minnesota GreenCorps is an environmentally focused AmeriCorps program coordinated by the MPCA, which places AmeriCorps members with organizations around the state to spend a year of service addressing critical environmental issues, while gaining experience and learning valuable job skills. Earth Hour is an annual event that invites each of us to turn off the lights for one hour in a “massive show of concern for the environment.” The City of St. Paul participates by turning off non-essential lights on all public buildings. Join in on March 23, 8:30-9:30 p.m. The Clean Energy Resource Teams (CERTs) connect individuals and their communities to the resources they need to identify and implement community-based clean energy projects. Join the Metro CERT for their annual spring resource and networking event, April 17, 4-8 p.m., Science Museum of Minnesota (St. Paul).